This year's Consumer Electronics Show had its share of wireless audio components, several of which I included in iPhone Life's coverage of the event. I found several new Wi-Fi AirPlay compatible speakers. Of the lot, I finally received a Wren V5AP ($399) review unit last week. Of all the Wi-Fi speakers I’ve had the chance to review in recent years, I must say this one truly gives the Sonos Play line a run for its money. Sonos, which recently added a home theater sound bar to its repertoire, is, in my opinion, the best Wi-Fi speaker technology available for less than $500. I've reviewed several competing products, but Sonos set the bar especially high in the areas of sound quality, overall design, and wireless flexibility. The Wren V5AP gets major props on all three fronts, but still runs a very close second in wireless capabilities to the top-of-the-line Sonos systems. 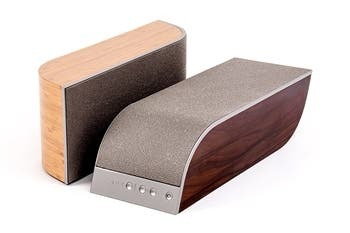 However, the V5AP has such an attractive, earthy design and great connection options, I’m tempted to give both the wireless speaker crown. It really is too close to call. The V5AP is of superior construction and has an edge on other wireless speakers I’ve reviewed in the look and feel department. Its real bamboo and rosewood veneers and unique shape lend the speaker a distinctively elegant look. The unit is well constructed and has dampening features, which allow it to play at high volumes without vibration (the base is a silicone pad). Powered by a Class-D, 50-Watt amp, the V5AP has no trouble filling a large room with sound without suffering a risk of distortion or significant loss of clarity. I use my Sonos Play:5 as the standard for many of my speaker comparisons, and I have to say side-by-side, both speakers produce excellent sound. I slightly prefer the lower profile arrangement of the V5AP. The V5AP kit includes user guides, power supply, cables, and a separate remote control. Configuration of the V5AP is about as easy as it gets. I configured my iPod touch on my test network. I turned on the V5AP, connected my iPod to the V5AP via the included 30-pin to USB connector cable, set the V5 source input to Wi-Fi, and shared my Wi-Fi information with it. Next, I opened the iOS player app and selected the V5AP in the AirPlay menu and started playing a song. I did this easily, without any issues. The V5AP is quite flexible, allowing you to run AUX line-in from any existing component. Using the remote control, you can change tracks and perform all of the standard player functions, but the unit can also be controlled using the buttons located along the front right edge. Docking your device requires you to change to the USB source input (it would be nice if it could auto-detect this), in order to play or control the iOS device from the remote. All of the ports are located along the back bottom of the unit, from left to right: a setup button, 3.5mm AUX, power-input, and USB port for the Wi-Fi configuration described above (also for docking). In a few instances, I had to reset my device to get the iPod to respond to the control input commands, but this has often been true of other docks and accessories. I ran aux input from my computer, tested streaming and the full gamut of player apps, and the V5AP was extremely capable as a computer audio sound system. A note about my wireless test setup — I tested the V5AP on a secondary wireless network I use for streaming apps, as I have experienced poor performance using wireless encryption with AirPlay (particularly at the network edge). I turn off encryption completely on my test network. For AirPlay, I recommend this configuration, though it makes connecting to the Internet problematic if you want to provide better network security for your home systems (which you do). I use AirPlay for streaming what I call "local music" (i.e. music resident on my devices in iTunes). I connected my iPod touch and the V5AP, for example, to the dedicated test network. The downside is that you can't really do any internet streaming using apps like Pandora in this configuration without an Internet connection. The V5AP is flexible enough to allow you to easily dock your iDevice for streaming, so admittedly you could get around this limitation by simply connecting the USB-30 pin cable provided (with your device connected to your main home network) and by selecting the USB as input source (the V5AP charges you device for it's trouble). I could get into the topic of bridging the "streaming" network, but admittedly for most users, the simplest is to use the latest Wi-Fi and encryption standards and keep all that streaming traffic on your main Wi-Fi network. The encryption/network aspects mentioned above are some of the reasons I am not enthusiastic about AirPlay, though it should work fine for most Apple-specific usage. This is another reason the Sonos systems, which do not rely on AirPlay, set a high standard for wireless speakers. The Play:5 can handle practically any wireless configuration and also can integrate playback and control functions of Apple or Android audio devices. It also wirelessly streams standalone apps like Pandora (and many other services) without any iOS or computer input at all. However, it does require a separate bridge device to do so. Sonos has developed an excellent client application that runs on iOS, PC or Mac, which the Wren unit lacks. The Wren has a remote control, which somewhat mitigates this lack, but is a standard I/R remote and requires you to be in close proximity to the unit. The V5AP also provides dock access for your iDevice, which you can't do without a Sonos dock accessory. The V5AP outclasses the Sonos (IMO) in overall looks, but both produce superior sound for a compact speaker system. My opinion is you can't go wrong with either. The V5AP retails for $399, and the company expects to announce an Android compatible Play-Fi version, and possibly a Bluetooth model later this year. Make sure to check iphonelife.com regularly for news, reviews, tips, and tricks on all things iOS. If you’d like to enjoy even more great content, consider grabbing a magazine subscription! Master your iPhone in one minute a day: Sign up here to get our FREE Tip of the Day delivered right to your inbox. Nate Adcock is a system and integration engineer with experience managing and administering a variety of computing environments. He has worked extensively with mobile gadgets of all shapes and sizes for many years. He is also a former military weather forecaster. Nate is a regular contributor for the iphonelife.com and smartphonemag.com blogs and helps manage both websites. Read more from Nate at natestera.tumblr.com or e-mail him at nate@iphonelife.com. Matias is beating Apple at its own game with a Tenkeyless Wireless Aluminum Keyboard. By removing the number pad, Matias has made space for larger arrow and function keys for a smoother typing experience. The keyboard’s Bluetooth connection means you can work anywhere, and with support for up to three devices, this keyboard is both portable and multi-use. The Matias Tenkeyless Keyboard has a rechargeable battery that lasts up to a full year on a single charge. With Mac-friendly function keys and a sleek, ergonomic design, the Matias Tenkeyless Keyboard outshines all of its keyboard competition, including Apple. Can You Hide Messages on iPhone?